Wedge sandal under US$70 is definitely a must footwear in your closet for summer. After months hiding your feet in chunky boots, summer is the time to refresh your legs in cute sandals. If you want to look stylish without suffer because of painful footwear? A wedge is the solution. A wedge is fashionable and very comfortable to wear than stilettos but still give slimming look on thick muscular legs. You can wear the colorful wedge sandal to enjoy summer season. They feet painless and add inches to your height. They can be worn with your casual dress including skirt, dress, jegging. In order to make your legs look slimmer, wear the open toe wedge sandal because showing more skin give the slim impression. Colorful wedge sandals for summer under US$70 are very tempting offer. You can look stylish without emptying your pocket. Here are some fabulous wedge sandals that available online. Enjoy!! The yellow wedge sandal is cost US$59.00; faux leather upper in a casual platform wedge slingback sandal style with a peep toe; knotted vamp straps; slingback strap with adjustable buckle closure; faux leather lining, cushioned footbed; 1 1/2 inch platform midsole; rubber traction outsole; 4 1/4 inch jute-wrapped wedge heel. 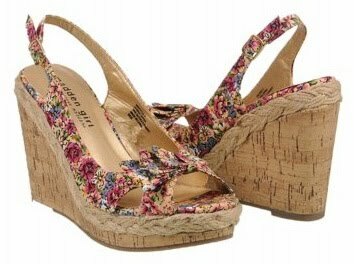 The floral wedge sandal is cost US$49.00; fabric upper in a casual wedge sandal style with a round peep toe; cutout details on vamp, bow accent; adjustable slingback with metal buckle; textile lining, cushioned insole; 1 1/4 inch jute and faux-cork wrapped platform midsole; 4 1/2 inch wedge heel; rubber traction outsole. The price of fuchsia wedge sandal is US$69.00; elasticized fabric and jute upper in a casual platform slingback wedge sandal style with round, open toe; crisscrossing vamp straps; metal stud detail; slingback strap; faux leather lining, cushioning footbed; 3/4 inch platform midsole; rubber traction outsole; 4 1/4 inch espadrille wedge heel. 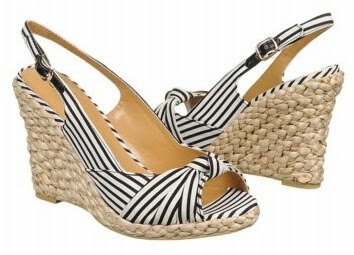 The price of black stripe wedge sandal is US$65.00; canvas upper in a casual slingback wedge sandal style with a round peep toe; center knot and pleating at vamp; slingback heel strap with adjustable buckle; smooth lining with a cushioning footbed; 1/2 inch wrapped platform midsole; Rubber traction outsole; 4 inch espadrille wedge heel. 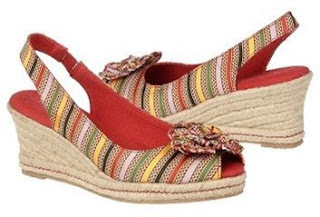 The rainbow sandal wedge is cost US$59.00; fabric upper in a slingback wedge sandal style with round, peep toe; flower detail at the vamp with contrast stitching accents; heel strap with an elastic goring inset to ensure a comfortable and secure fit; lightly cushioned fabric insole; just wrapped midsole; non-slip outsole, 2 1/4 inch espadrille wedge heel.